Speer Lawman 9mm Luger Ammo 147 Grain Total Metal Jacket for sale online at cheap discount prices with free shipping available on bulk 9mm Luger ammunition only at our online store TargetSportsUSA.com. Target Sports USA carries the entire line of Speer Lawman ammunition for sale online with free shipping on bulk ammo including this Speer Lawman 9mm Luger Ammo 147 Grain Total Metal Jacket. Speer Lawman 9mm Luger Ammo 147 Grain Total Metal Jacket ammo review offers the following information; Settled in Lewiston, ID, Speer ammunition has been synonymous with safety for Law Enforcement for years and the Lawman line built the reputation line from the ground up! Without a doubt, Speer Lawman remains the best choice and this is the best quality law enforcement on the market- period. Developed as a dual line for both law enforcement and sports shooters 35 years ago, the Lawman line has been earning its well-deserved status with its reliable, durable and superior preforming handgun ammunition. Speer Lawman completed its 9mm Luger ammunition to be Total Metal Jacket or orthodox Full Metal Jacket depending on the product. Total Metal Jacket is the perfect pick for target shooting, training, or out for the day plinking away at the range. Made of a combination of clean-burning propellants, CCI primers and Speer bullets, Lawman Ammunition is a great mixture of budget and presentation. Whether new to shooting or a seasoned veteran, Speer Lawman ammunition should be your absolute first choice! 9mm Luger ammo by Speer Lawman is new production, non-corrosive ammo, featuring a brass casing and boxer primers. This ammo is reloadable for those high volume shooters who love to reload their 9mm Luger ammo. 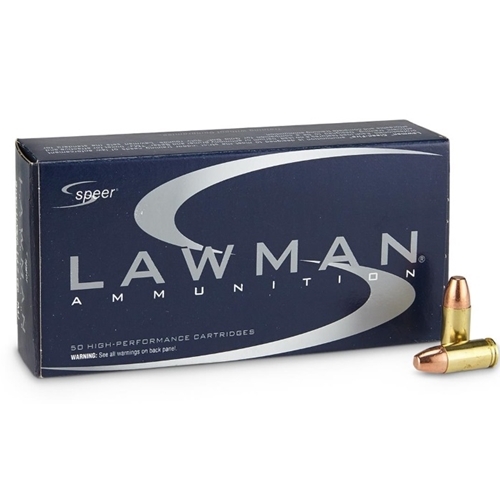 Speer Lawman packages this ammo in boxes of 50 rounds and cases of 1000 rounds. Purchase a case of Speer Lawman 9mm Luger bulk ammo from Target Sports USA and receive free shipping! I've used a lot of this stuff suppressed, and unsuppressed. It runs moderately clean, and goes bang every time through multiple hosts. It is my favorite budget 9mm. Target sports has great shipping, and I like that they use UPS to ship now.